I've kept the blog largely apolitical, but after watching Obama's masterful speech in Berlin, I had to post this. If you'd like four more years of Bush, by all means vote for McCain. 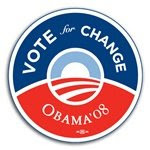 If you want change then Obama is your man. Wow, someone else that wants to vote for Obama just because he says "change" a lot. Dude, you need to stop drinking the Kool Aid and think for yourself! What the hell do you think Obama is going to do with this whole housing thing? If you think this bailout was huge, you ain't seen nothin' yet. I do think for myself and always have. Those that voted for W were the sheeple then, those that vote for McSame will be the sheeple now. As far as the housing situation, it was created and festered largely during Republican rule. Can the dems really do any worse? A year after the election onow how's that Hope and Change working you champ? How that stimulous package going? Think unemployment will go to 11%? 12%? Feel that deficit? Feel those higher taxes coming? Inflation? Yes, Bush and the Republicans made quite a mess of America. You and everyone else who voted for him should be ashamed, Jim. I can't decide if people like you are just so extremist that they can't see the truth or maybe it's because you're just plain old too stupid. Are Your Bank Assets at Risk?